'Like' our campaign on Facebook to Stop culling Grey Squirrels! 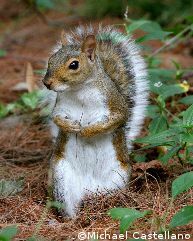 As a grey squirrel, I've watched with great interest and dismay the many news stories claiming that we are "aliens" to the United Kingdom, and killers of our friends the red squirrels. As a senior adviser to Squirrel Natural Heritage (SNH), I feel it is my duty to try to dispel these myths and show that a lot of the "scientific evidence" quoted by conservation groups, and even government organisations, is based on a political desire to attain an idealistic version of nativeness, rather than a sensible realisation that humans are part of the environment, like ourselves, and we can all live together in peace. When you look in depth at what these organisations are saying, you find that even their definition of being "native" is quite questionable. ...it is our very lives which hang in the balance! While we get on very well with humans, and have been very well able to adapt to the changes you have brought about in the UK, our poor friends the red squirrels have been less fortunate. Conservation groups are very keen to encourage the planting of "native" deciduous trees which just happen to be the kind of habitat we love to live in. In doing so, the many conifer woodlands once all over the UK have been decimated, and the Red Squirrels have been the unfortunate victims. We are also blamed for the poxvirus which is currently spreading through the Red Squirrel population. Having done extensive research, we have found that this virus also affected our population many generations ago, but those of us who survived developed antibodies which protect us. The Red Squirrels are in a similar position now, and provided humans give them a chance by not removing their habitat, a good percentage might well survive and be immune. This is the way that nature works! Trapping us in cages, and then putting a bag over the end of the cage, so when we get chased into it, we can be bludgeoned to death. All of these methods of "controlling" us are termed as "humane" - we call it murder! Tell family, friends, co-workers and others about this site. Don't be afraid to share the facts when you hear others blaming Grey Squirrels unfairly. Contact Elizabeth Truss MP telling her to take grey squirrels off death row!